The Birdhouse @ www.thesltcardinals.com the online leader for exclusive, objective and independent coverage of the St. Louis Cardinals, providing the ultimate fan experience through community interaction with our team of experts, writers and reporters. John “Johnny” Grodzicki was born in Nanticoke, Pennsylvania on February 26, 1917. By 1937 he was playing professional baseball with the Houston Buffs of the Texas League and won 18 games. During the Texas League all-star game on July 17, 1937 at Houston, Grodzicki struck out six batters in a row. The tall right-hander was again with Houston in 1938 and spent 1939 and 1940 with the Rochester Red Wings, joining the Columbus Red Birds in 1941. Grodzicki led the league in winning percentage that year with a remarkable .792, which was assembled from his 19-5 record. Grodzicki also made five appearances with the Cardinals in 1941. He pitched 13.1 innings over five games for a 2-1 record and an impressive 1.35 earned run average. Grodzicki was one of the top prospects in the Cardinals organization but on January 14, 1942, Grodzicki followed in the footsteps of his two brothers and entered military service with the army. 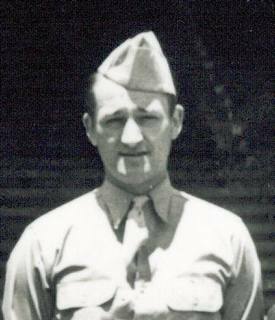 He was initially based at Fort Knox, Kentucky, and on May 24, 1942, Grodzicki was selected by Bob Feller – along with fellow servicemen Cecil Travis, Zeke Bonura, Emmett Mueller and Ken Silvestri – to join Dizzy Dean’s all-stars in an exhibition game at Wrigley Field against Satchel Paige and the Kansas City Monarchs. On July 7, 1942, Grodzicki was selected for an All-Service team that played against an American League all-star squad at Cleveland’s Municipal Stadium. Before 62,059 fans, the American League beat the servicemen, 5-0. The All-Service pitchers before the game against the American League all-stars at Cleveland. 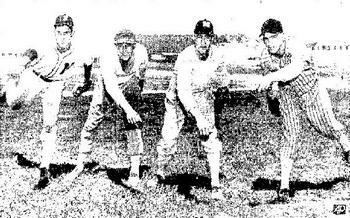 Left to right: Fred Hutchinson, Johnny Grodzicki, Bob Feller and Mickey Harris. Grodzicki later transferred to the paratroopers and joined the 17th Airborne Division. The 17th Airborne Division was sent to England in August 1944. They remained there until December, when they were flown to the Reims area in France took over the defense of the Meuse River sector from Givet to Verdun. In January 1945, they marched through the snow to Morhet, relieving the 28th Infantry Division. The 17th entered the Ardennes campaign (better known as the Battle of the Bulge) on January 4 at the Battle of Dead Man's Ridge. On March 24, 1945, the 17th Airborne Division took part in their first airborne assault. Taking off from marshalling areas in France, nearly 4,000 aircraft from the British 6th Airborne Division and the American 17th Airborne Division dropped fighting men – including Grodzicki - behind enemy lines, into Westphalia in the vicinity of Weselon which was east of the Rhine River. Their mission was to capture key points and so assist the advance of the ground troops. It was the first airborne invasion over the Rhine into Germany itself. On March 25, the 17th Airborne Division had secured bridges over the Issel River and had entrenched itself firmly along the Issel Canal. Moving eastward, it captured Haltern on March 29, and advanced on Munster the following day. It was on this day that a shell exploded nearby, shrapnel flew, and a large, jagged piece cut deep into Grodzicki’s flesh just below the right hip, and another piece entered his lower right leg. Grodzicki was removed to a field hospital. Examination disclosed that the sciatic nerve had been badly damaged. There was danger that he would never walk again. An operation was performed, and the shrapnel was removed. Grodzicki was then sent to a hospital in England, and finally to the United States for recuperation. He learned to maneuver with a cane and steel brace on his right leg, and after receiving his honorable discharge in October he went home to Nanticoke to rest. But Grodzicki didn’t stay home for very long. In October he headed for Panama where he pitched batting practice for the Colon club. The arrival of the New Year found Grodzicki eager and ready for spring training. Daily treatments were given his leg. Hot towels were applied, and special massages administered in the hope that he would be able to play again. On April 11, 1946, in a spring training game against the Oklahoma City Indians of the Texas League, Grodzicki made his post-war pitching debut. Wearing his leg brace and with a perceptible limp, Grodzicki pitched the last four innings and gave up four singles in the Cardinals’ 8-1 win. In June 1949, Grodzicki left Houston and joined Rochester of the International League – another team he had played for back in the late 1930s. He made his first start for the Red Wings on July 2 and staggered to a complete game 11-7 win over the Baltimore Orioles. Through a working agreement with the Cardinals, the Geneva Redbirds of the Alabama State League acquired the services of Grodzicki as their manager in 1950, but he was replaced in July and joined Omaha in the Western League where he pitched for the rest of the season. He posted a 3-1 record with the pennant winners. In January 1951, Grodzicki – who had been playing winter ball in Panama for the last four years – was named player-manager of the Balboa Brewers in the Canal Zone League. Returning to the United States at the end of the winter season, Grodzicki started the 1951 season with Columbus. He was sent back to Omaha in June and in July 1951 he moved on to the Winston-Salem Cardinals of the Carolina League. Grodzicki remained with Winston-Salem in 1952. Grodzicki became a pitching coach and scout with the Cardinals organization in 1953, touring the United States and Canada instructing young hurlers. He remained in that position until taking a coaching assignment in 1963 with the Buffalo Bisons under manager and former teammate, Whitey Kurowski. After a season with Buffalo, Grodzicki left baseball for two years but was enticed back by the Detroit Tigers, who hired him as a minor league pitching instructor in 1966. He remained in that role until 1979, when the 62-year-old returned to the major leagues as a coach with the Detroit Tigers. Johnny Grodzicki passed away on May 2, 1998 in Daytona Beach, Florida. He was 82 years old. Created March 24, 2007. Updated April 3, 2008.